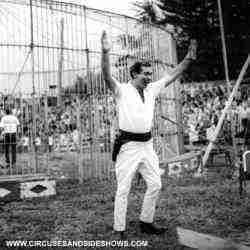 Dave Hoover, animal trainer performer and owner of the L. E. Barnes Circus. As a boy, Dave Hoover always wanted to be a vet. After training with a vet at the Cincinnati Zoo, however, he decided he was "too squeamish" for the job. "I couldn't stand the sight of blood-the animals or my own," he recalled. His stint at the Zoo turned him away from veterinary medicine, but it turned his love of animals in a different direction-a fascination with the "big cats," the lions & tigers who instill terror in the hearts of man & beast alike. 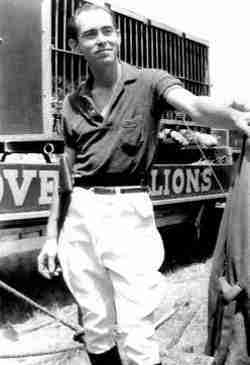 As wild animal trainer for the Clyde Beatty Cole Bros. 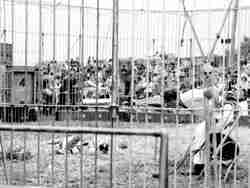 Circus, the once-squeamish Hoover thrills audiences each night by entering a cage filled with lions & tigers, none of whom are restrained & all of whom would like nothing better than to tear him apart. With whip, chair & blank pistol, he puts the cats thru the paces in a "fighting style" performance that has all but disappeared from the modern circus scene. The amiable, outgoing Hoover was a protege of the late Clyde Beatty, considered by some to be the greatest wild animal trainer who ever lived. Upon Beatty's death, he agreed to fulfill the last 3 years of the trainer's contract. That was 15 years ago. 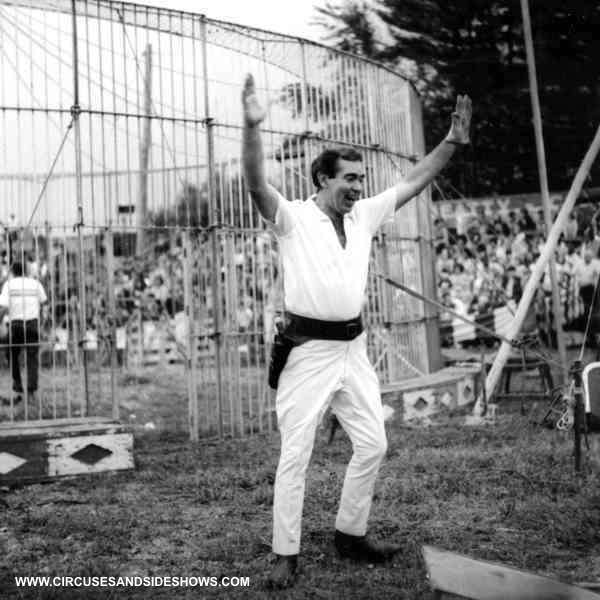 He considers his act the last of the vanishing style of circus performances. 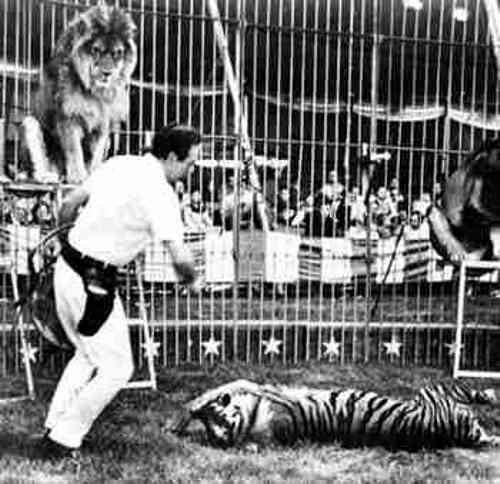 "I am the last American trainer-all the wild animal trainers but me are European-style trainers, using an entirely different method," he explained. In the European style, he said, training starts at a very early age so the animal's natural ferocious spirit is broken-by force or by fear. In contrast, Hoover doesn't start working with a lion or tiger until it is almost 18 months old, which is equivalent to a teenager in human terms. And he trains by repetition, not force. "When I give a lion a command, he knows what he has to do, but because he is naturally independent & lazy, he doesn't want to do it, so we have to fight about it. 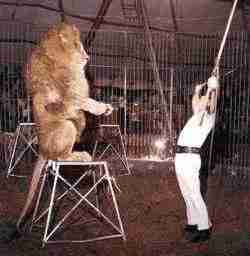 In European-style training, the animal obeys right away. He's not a wild animal anymore-he's a robot," Hoover said. Because no man can physically subdue a lion, Hoover concentrates on out-smarting them. "Mental bluff is the key," he emphasized. "They don't know why I'm not afraid of them. Of course, I really am afraid of them, but they don't know that. 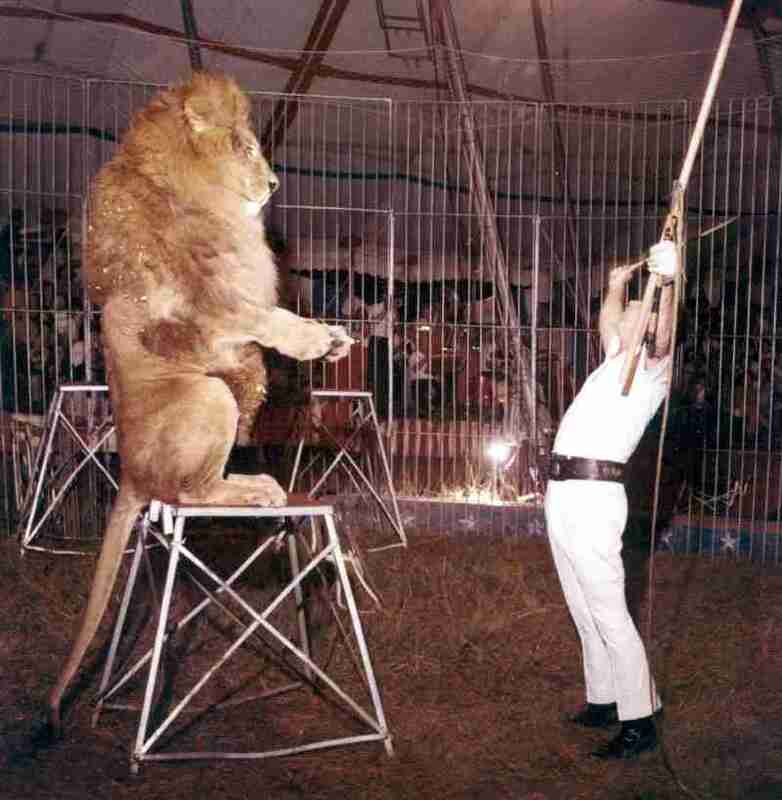 The animal doesn't realize how strong he is & he doesn't know how weak the trainer is." A basic understanding of the rules of the jungle helps Hoover keep control of the cats. "In the wild, one male lion is the boss over a group of females, & his territorial instincts are very strong. The trainer, in effect, has to replace the head animal, he has to replace the head animal, he has to become the leader of the pack," he explained. Jealousies on the part of the male lions increase the tension. 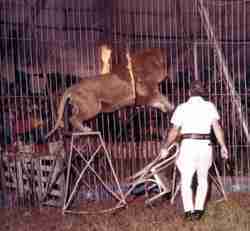 To further complicate matters, Hoover mixes tigers & lions in the same cage, the only trainer still doing so. Even the animals' mating habits & sexual tensions come into play. "The tigers are monogamous-they choose one mate for life. But the male lions mate with different female lions & will even mate with female tigers, so they are very jealous of each other. And since there's always at least one female in season ('in heat'), it gets extremely tense in that cage," Hoover observed. A cardinal rule of training, he said, is to never let the animal know that he has hurt you. He pointed to a long scar on his left forearm that looked a little fresher than the numerous scars lining his hands and arms. "I was clawed by a lion 2 1/2 weeks ago during a performance. He hit a major vein & I was bleeding all over the place, but I hurried the act along, finished it & left the cage. Then I collapsed, but that animal never knew that it hurt me." 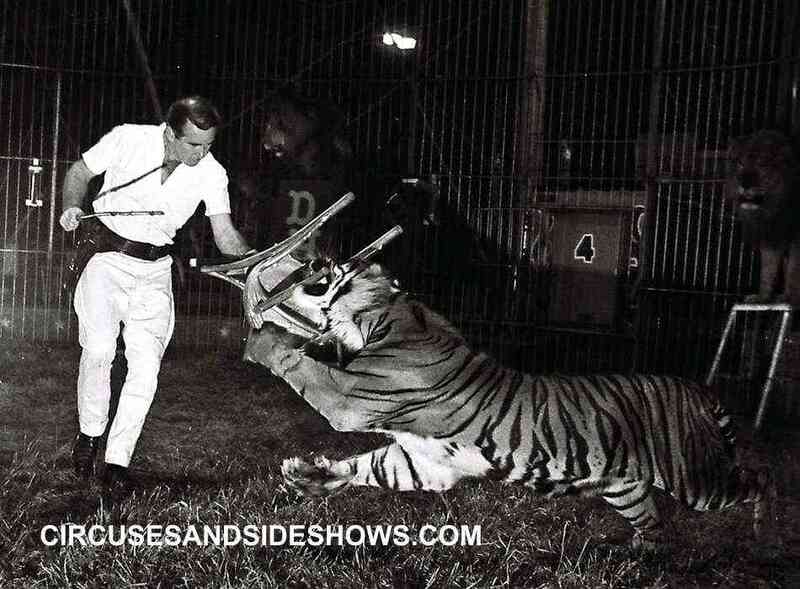 In his 15 years with the circus, Hoover has been attacked many times by his cats. He has been hospitalized 13 times, for periods ranging from 4 days to 3 months. His grin fades as he recalls his most serious injury, when a lion attacked him during a training session at Lubbock, TX several years back. 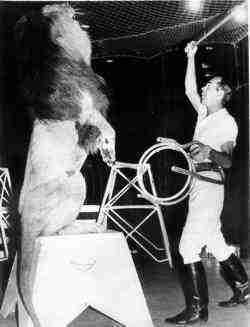 The lion got a claw caught in Hoover's watchband & pulled the trainer in, mauling him. Dave escaped, but his cuts were so extensive he required 152 stitches & 3 months of hospital care. "I did 3 stupid things there-I was wearing the watch, I had on a wool jacket which attracted the lion & I was in there by myself-and I almost got myself killed," he said. 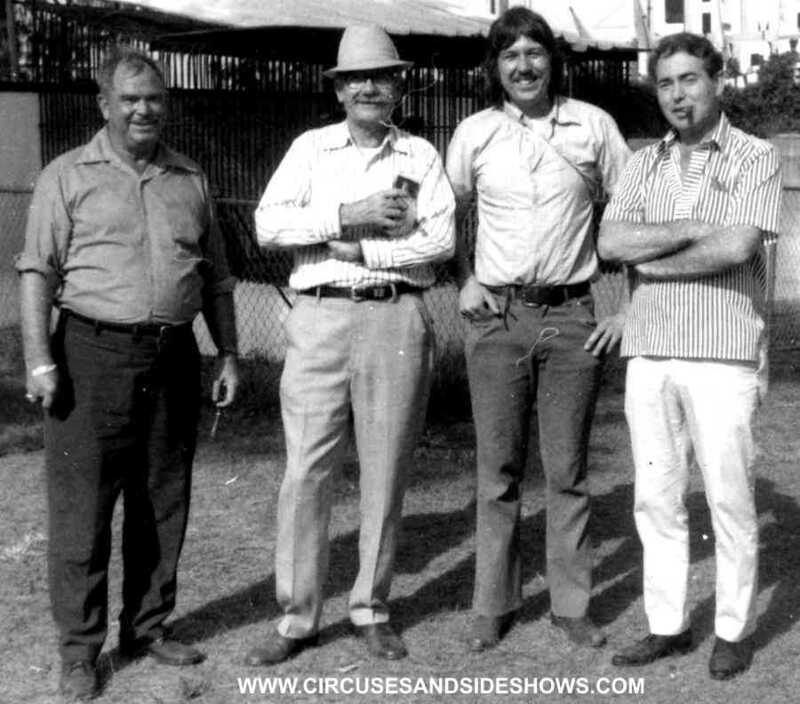 Like many circus acts, Hoover's performances are a family affair. Lois, his wife of 20 years, is the person who opens the "cat cages" at the start of the performance & 13-year-old son, George, mans the "escape door" of the steel arena. During the off season, the family make their home in DeLand, FL, where Hoover trains new cats for the act. He is with the animals 7 days a week, 365 days a year. "This is not the kind of job you can take a vacation from. If you're training an animal, he has to be trained everyday, including Christmas. If you're on the road, you can't ask for the 4th of July off for a family picnic. 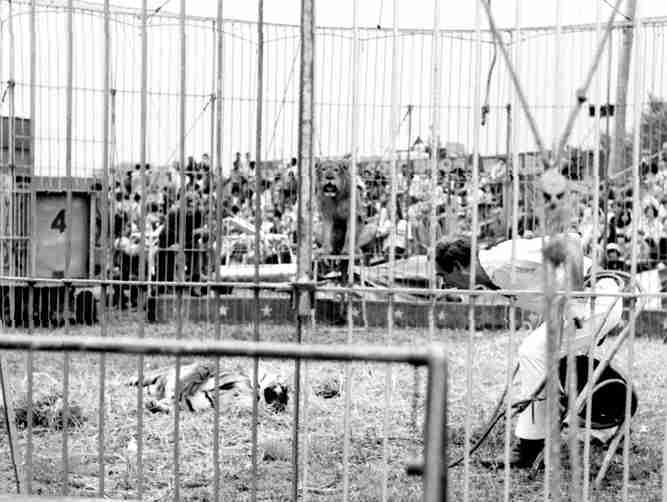 I have very good cage attendants, but if one of these animals gets sick or gets loose, I'm the only one that can do anything about it." "They're mean, they're stubborn like mules & they're always looking for trouble." "I chose animal training simply because I love animals. I started college to be a vet & the Korean War got pretty thick & I joined the Air Force. When I came out I became circulation mgr. for a Cincinnati newspaper. 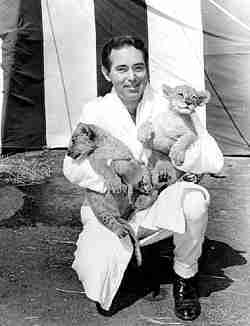 I had picked up 3 young yearling lions when I was in the Air Force & I was keeping them as a hobby. With all the hassles at the newspaper, I just went into this as the course of least resistance. You have to love animals to be in this business & I'm probably a success at this simply because I'm doing what I like to do." When he formed an act 23 years ago, he wore a steel collar; cats, it seems, instinctively go for the throat. "But it was too hot & uncomfortable. I learned to stay light on my feet instead. One tiger got 3 men in one day. Lions are the worst. They're lazy & nasty. They spend all day looking for trouble, waiting for somebody to get near enough to grab." He walks by a lioness' cage & she snarls, swatting the bars with claws that appear like stilettos. He buys & trades young cats for training until they reach the age of 4. "Then they stop responding. They start to get mean. What they've learned at that point, they've learned." The cats aren't asked to perform tricks like walking on their hind legs because Hoover says they weren't built for that. "My animals have free will. They don't respond in a split-second; they think about it, growl a while, they do it—usually." Once in Philadelphia JFK Stadium, Hoover stumbled in the middle of his cat act. He landed on his back, his pistol beneath him. A lion caught him squarely in the chest. "Luckily, my stick caught him in the mouth & deflected his jaws. But all my people could see was my legs sticking out from beneath this cat. They thought I was a goner. Another lion seized the opportunity. He figured he'd get the other male & me at the same time. That was as close to dead as I care to come. The guys got them apart & off me." To Hoover's amusement, the city's papers wrote up the incident as a case of feline heroics. 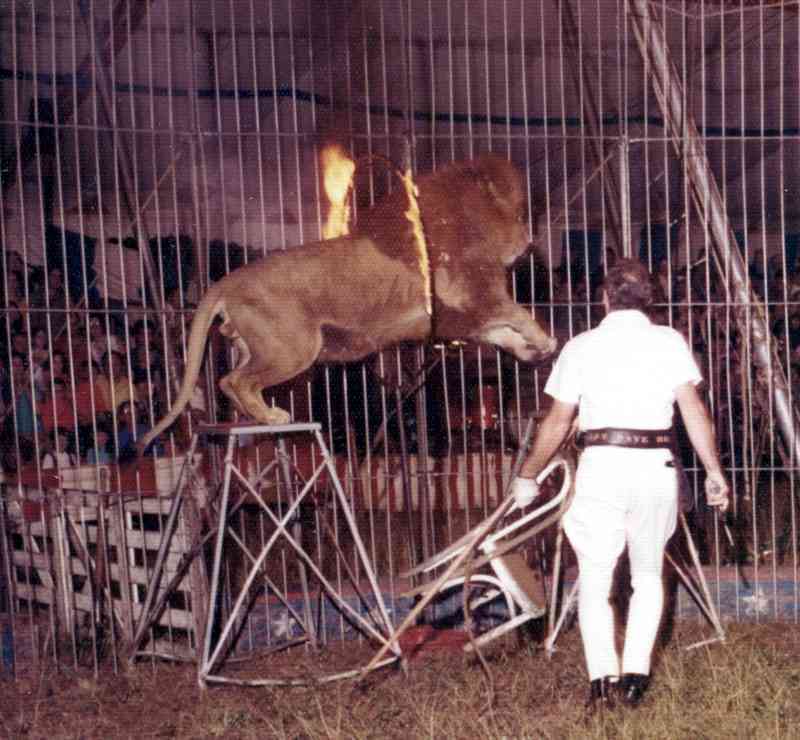 "It looked to the audience like the second lion was trying to save me." 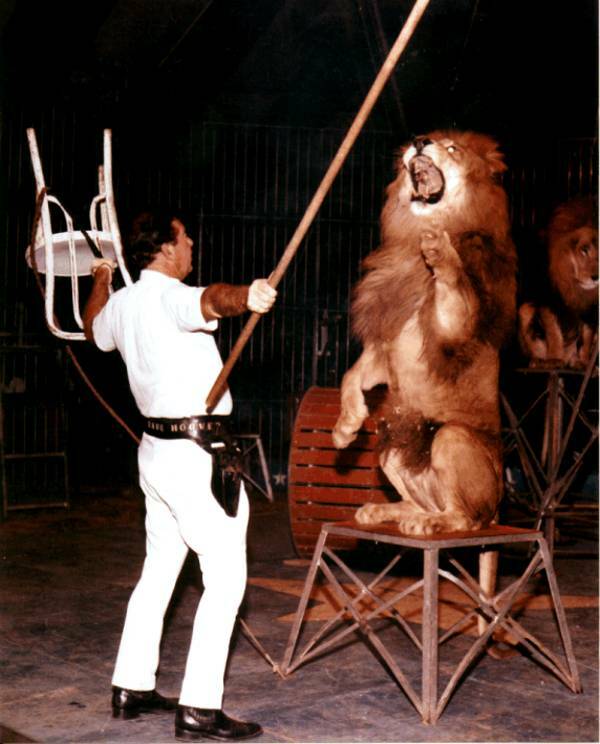 He tries never to forget that the big cats are not circus props. "When they snarl, they they mean it! And so do I when I'm trying to get out of their way." 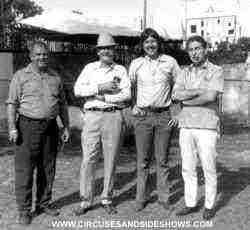 Click Here to read more about Dave and Lois Hoover and the L. E. Barnes Circus. 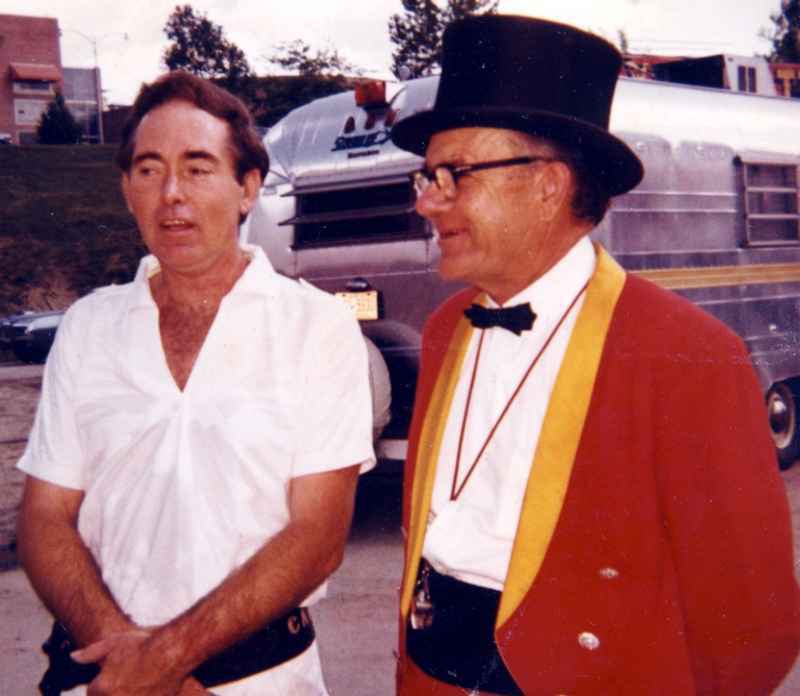 Bob Noell, Roger Boyd Sr., Roger Jr.